We’ve tried a few of the dining options in Old Amersham over the past year or two. We were bowled over by the standard of cuisine in the Artichoke restaurant and have some good experiences in some of the pubs and the deli. This was the turn of another pub, the Swan, located further away from most of the shops and eateries, down the western end of the high street. Our visit was at a quiet time before dinner got underway, however the outside area was proving popular with afternoon drinkers. We settled in to a table by the window to overlook the high street, accompanied by a pint of Rebellion from the Marlow Brewery and Aspall Suffolk Cyder. There was a really nice selection on the menu, which would cater for most tastes. The food was good, although not quite perfect, as while my lamb was deliciously succulent and tender, Tara’s duck was overcooked. Nevertheless, with friendly service, pleasant atmosphere and good food and drink overall, we’d recommend giving it a try. 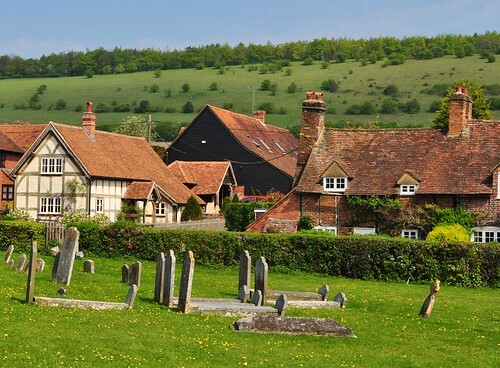 The village of Turville is widely known as a picturesque jewel in the Chilterns, but the fact it was also the outdoor filming location for the Vicar of Dibley made it an easy choice for us, as Tara’s quite the Dibley fan. There’s little in the village itself, but for us it was an absolute pleasure to wander the small streets around some of the prettiest historic buildings and Chilterns countryside you could ask for. For those looking to spend a while longer to absorb the atmosphere, there is a village pub and a walk up the hill to the windmill. We decided to follow recommendations and travel the short distance up the road to the next village of Fingest. We pulled into the Chequers pub, which has a good write up in the Good Pub Guide. The menu was a little more limited than we’d expected, being largely meaty pub classics. I opted for sausage and mash, clearly comprising nicely sourced produce. We’re rather unsure about the future of the Chequers, however, as the current landlord was leaving the following week for a pub in Medmenhem, near Henley. Hopefully there’ll be a new landlord to carry this pleasant pub into the future. The village of Fingest lacks the jaw-dropping looks of Turville, but it has a fine Norman church and is worth a brief stroll. View our set of photos from Turville and Fingest on Flickr. Looking for local events over Easter weekend, we came across the Chilterns Easter Festival of Food and Drink in Great Missenden, which it happily transpired was being run by the family of one of our favourite local tweeters. Such festivals can sometimes be rather hit or miss, but this one was certainly on the money for us, offering a wide range of produce and goods, including many that are locally grown and crafted. There was a nice amount going on: demonstrations to drop into, a food tent for lunch, outdoors for relaxing and of course dozens of stalls. View our set of photos from the food and drink festival. Wrapping up the Easter holidays we looked for a local day trip, and opted to try the Harte and Magpies pub in Coleshill, near Amersham. This is the sister pub of the Royal Standard of England at Forty Green, near Beaconsfield. We suspect the Harte and Magpies doesn’t have the wow factor of its sister, but it offered a good menu with some nice specials, and many were enjoying the outdoor seating. The village of Coleshill is very pleasant to have a potter around, although rather too far from the pub. The village common was a remarkable combination of quintessential green which turns into a splendid woodland walk. Very nice indeed, and look out for the windmill.